The article being referred in the above tweet is titled ‘Gauri Lankesh was a brilliant and brave journalist. She was my friend. And they murdered her’ by one Shikha Dalmia, in The Week (September 8, 2017). Luce spent time in Bharat as a correspondent for The Financial Times, United Kingdom. Upon completion of his term, he was moved to the United States of America, to report on matters in that country. It appears that he has kept ‘alive’ an abiding interest in affairs of the country he left – the cliché (“You can leave India, but India does not leave you”) does have merit! While in Bharat, he did spend a fair amount of time on matters relating to politics in addition to economic issues, the latter supposed to be a specialisation of the publication that sent him to Bharat. Of course, there is nothing wrong in this, since politics and economics are intertwined in a democracy, and to understand one there is also a need to understand the other. In the last Lok Sabha elections in 2014, the National Democratic Alliance won 336 seats, and the BJP, the major partner in the alliance, won 282 seats. This was the first time for thirty years that a pre-poll alliance had won a majority of seats in the Lok Sabha, and that a single party had crossed the half-way mark of 272. The Congress party, the darling of the ‘intellectuals’ (masquerading as secularists), was decimated, and the number of seats that it won reduced from 206 to 44. For the first time, a party that was ideologically opposed to the Congress was able to form a government with a comfortable majority. The election sent those who claimed to be experts on affairs relating to Bharat in a big tizzy. They just did not know what exactly was happening. They were now expected to explain to their readers what happened. I thought their task was made easy given what the late Dileep Padgaonkar confessed in an article titled ‘A missive to distraught liberals’ in The Times of India dated May 30, 2014. But then, being honest is not a qualification that an analyst on affairs relating to Bharat is required to have. Otherwise, they would have to work hard at what they are doing, and have to acquire a skill other than using language as a substitute for logic. And so it should be pretended that Padgaonkar’s article does not exist, and write on the basis of an agenda and not truthfulness. One such effort was an article by Luce himself, titled “Modi’s existential challenge to Obama”, Financial Times, May 25, 2014. When Luce was in Bharat, he had made a special attempt to demonise the Sangh parivar organisations in the UK. He had accused them of funding the Sangh organisations back in Bharat primarily to enable them to attack the non-Hindus there. The allegations in both the countries were blatantly false. But this caused a lot of angst for the Sangh parivar organisations. They had to not only deal with the authorities in the UK to prove that the allegations were false, but they also had to respond to their well-wishers in whose mind a doubt was sown. The Sangh parivar is run by people who devote their time and energy purely on a voluntary basis. For these people to respond to false charges made deliberately, involves devoting far less time to the positive activities that they consider not just necessary but which give them a lot of personal satisfaction. Due to the persistence shown by the Hindus, this destructive activity of Luce was defeated. Additionally, Luce got his editors to write to the Charity Commission in UK, a letter in which it was said that the Shri Ram Janmabhoomi Nyas, the trust set up to rebuild the temple in Ayodhya, has an apparent wealth of $350 million, and the unaccounted wealth is many times more. When I asked him the source of his information, he said that this is what he was told. He merely parroted the lies that the anti-Hndutva lobbyists were spreading, and so allowed himself to be a part of a public relations machinery out to spread canards against the Sangh. He did not check the public documents that are available in the concerned government office. But then he would have to tell the truth, I guess – which would be very uncomfortable. Fake analysis and intellectual gymnastics actually means telling lies. For any unbiased person, the extreme contradiction in this one sentence would have raised a red flag about Dalmia’s intent. But Luce has the very same intent, which is also clear from what he has written in the past. And so, the numerous articles, even in mainstream English media in Bharat, questioning Dalmia’s narrative, have to be ignored. It is ultimately a question of what one wants to believe, and then seek data that conforms to this belief. Within a few hours of the murder, the likes of Dalmia had already solved the case, and confidently said that it was one of the votaries of Hindutva who was the murderer. It would seem to me that the state should dismantle their investigation machinery and outsource it to the people who claim to be activists. Just like Luce was able to solve the financial ‘misdeeds’ of the Ram Janmabhoomi Nyas by just talking to a few people in Lutyens’ Delhi. Ultimately, what all such people are seeking is not justice, but to demonise the Sangh Parivar, whom they have identified as their ideological enemy. They know that their own privileges are at serious risk, as narrated by Bhalla above. Gauri Lankesh’s brazen murder is another proof of the much-deteriorated law & order situation in Karnataka today. Unfortunately, we have seen even more shocking murders recently in Karnataka like that of RSS swayamsevak R Rudresh who was hacked to death in broad daylight on a busy Bengaluru street. One hopes that the present Congress Government in Karnataka takes firm steps to solve the Gauri Lankesh and other murders, and brings the perpetrators to book. So why did the mainstream English media decide to put Lankesh on a pedestal? It has been established time and time again, over the last three years, this media does not have any great admiration for the persons from whose shoulder they fire their guns on the votaries of Hindutva. They were just desperate as Bhalla observed – they thought that the privileges they were getting were their god-given right, and they had to fight back with whatever means they could to latch on to them. The reader will ask whether this extremely nasty view of Lankesh provides justification for a member of the Sangh Parivar to kill the lady? 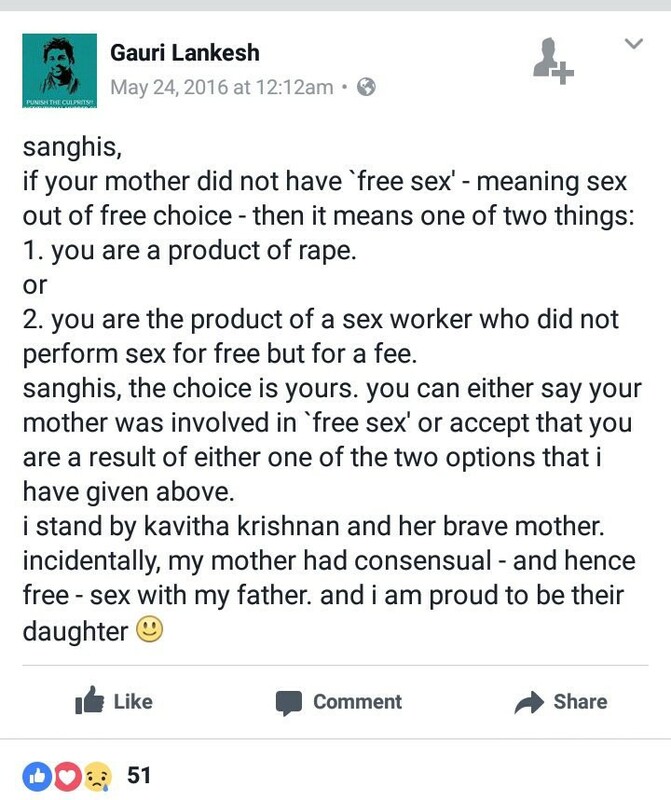 It has to be realised that Lankesh is not the first person to exhibit such nastiness. In many ways, what Luce wrote when he was in Bharar, and continues to write, is just as nasty. Stating nastiness in words and idiom that would conform to the rules of Queen’s English does not make it any better. The murder of the three ‘spiritual’ brothers happened over a period of few years – and police investigations have found nothing remotely incriminating against any Sangh organization. So, let the Hindutvavadis not fall for the guilt trip tactics that they are often confronted with just to silence them. If Lankesh was a nasty lady, that does not justify her murder, but neither does her murder cleanse the nastiness. And, if the English media wants to make her to be a journalist of repute, and she is not, let it be stated. That does not mean the Hindutvavadis are justifying the murder. It means that they are exposing the English media. The hysterical manner in which the Old Elite (to use Bhalla’s term) has taken up the issue of the murder of Gauri Lankesh, and used it for their political agenda has been exposed by social media. They brought out these double standards by bringing out the silence in the cases of murder of journalists, clearly identified as having been done because of their journalism. On September 20, a journalist in Tripura, Santanu Bhowmick, was murdered apparently by an organisation called Indigenous People’s Front of Tripura. Now let us see whether Dutt forgets, once again, to march for Bhowmick at the same venue as she did for Lankesh. She may remember, but I am not holding my breath. Do you think there is much the West can do about it? No. But it’s troubling and people should be aware of it. This grandly arrogant statement (‘people should be aware’) is part of the way that the anti-Hindutva gang operate. They want the people outside Bharat to be in a state of fear about what is happening in Bharat, not on the basis of evidence, but on basis of their say-so. Their tragedy is that the people know better and they realise that while there is crime and the odd outbreak of violence in Bharat, Hindutva is not the fascist threat it is made out to be. It is time for people like Luce to realise that their fake analysis and intellectual gymnastics has never received traction. With the help of social media, the people of Bharat are more effectively able to bring out the lies to the notice of the people of the world. The liars should also realise that they make a living from the money provided by the readers and the advertisers. Their loyalty should to the ones who ensure that they have a meal on their table, and not to a failed ideology where truth just does not matter. Working President (External), Vishwa Hindu Parishad, Bharat.